I could so relate to this blog on accepting the things I can’t change. Being someone who has issues with co-dependency, I can say that I have found that trying to force someone to do what I think they should do and making them do what I know is right doesn’t work. It really does cause frustration for me and the other person and is causes rebellion. In my studies recently I was reminded that Satan’s plan was to force us to do what we are suppose to do with no choice in the matter. I am so grateful that we all chose to follow Jesus Christ and Heavenly Father’s plan. So realizing that helped me to see that what I was doing wasn’t Heavenly Father’s plan at all. We have been blessed with free agency. I know that I myself don’t like being forced at all. I rebel big time. I appreciate being reminded of acceptance that I can’t make someone be like I want them to be nor to do what I want. 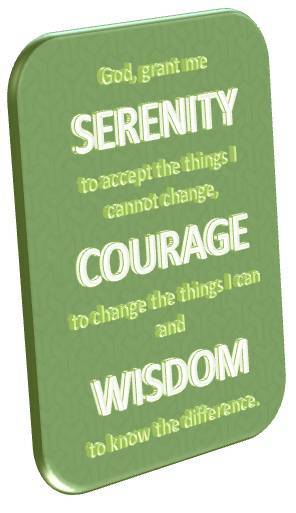 I had never read the rest of the serenity prayer and am thankful for it’s message.